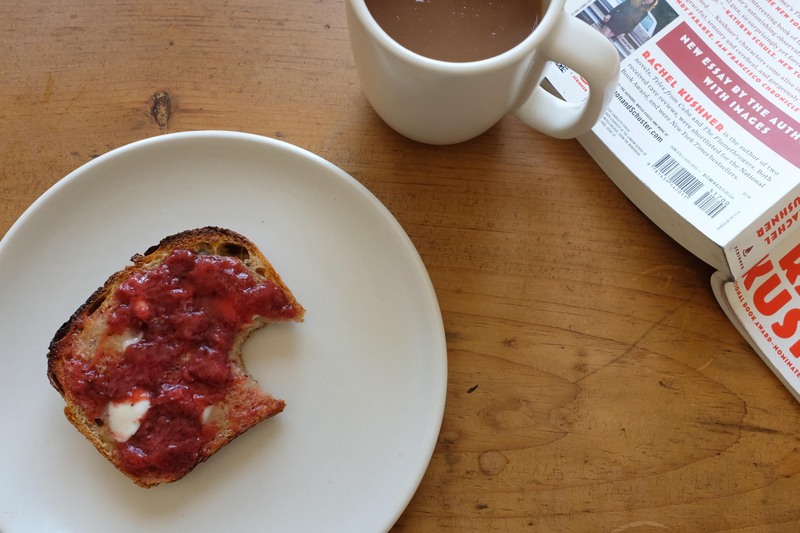 When my friend Anna was pregnant with her gorgeous Maxime, she loved strawberry jam. Whenever I have it, I am taken back to her little home. We are sitting and talking together by the warmth of the heater, her drinking milo, mug balanced on her tummy, me drinking chamomile tea with honey, and the tree outside the window is heavy with lemons. Anna is eating strawberry jam on toast. With Anna in mind, I had a go making strawberry jam. I didn’t do a great job of measuring, watching the pot in case it boiled over or timing things, but the end result tastes pretty damn good with plenty of butter on toasted fresh bread. If you want it to set more and be more jammy, use equal amounts of sugar and fruit. I just think that is a whole lots of sugar to be eating, plus I’m not really a sweet tooth, so I would rather have slightly sloppier jam that tastes like fruit, so I used less sugar, more fruit. Up to you with measurements. Quarter the strawberries and put in a pot with the brown sugar. Leave for a couple of hours at room temperature. Apparently fruit likes to do this before it is made into jam, I don’t really understand why but other blogs told me so. Then put on the element with the other ingredients and bring to the boil. Be careful here, as it likes to overflow everywhere and get really sticky on the elements. I boiled mine for about half an hour and then poured it into a sterilised jar and left to set. Enjoy this as a strawberry hit on vanilla ice cream. Or with butter, toast and tea, thinking of friends like Anna as I am. This is such a sweet post Anna!!! Thanks Livs. I so loved reading the blog for an update on the latest adventure and cannot wait to see what it produces!